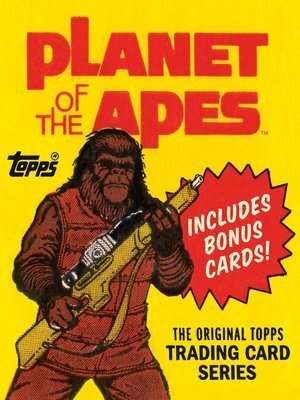 In 1969, Topps released a set of trading cards based on the classic 1968 science-fiction film Planet of the Apes. The original set of trading cards proved so successful that Topps released a set based on the 1975 television series and the 2001 reboot film by Tim Burton. This deluxe collection includes the fronts and backs of all 44 cards from the original 1969 Topps set based on the original film; all 66 cards based on the 1975 television series; and all 90 base cards, 10 sticker cards, and 44 chase cards from the 2001 film. Also included are four exclusive bonus trading cards, rare promotional images, and an introduction and commentary by Gary Gerani, editor of hundreds of trading card series for Topps—all packaged in time for the release of the latest installment in the franchise, War for the Planet of the Apes. The Topps Company, Inc., founded in 1938, is the preeminent creator and brand marketer of sports cards, entertainment products, and distinctive confectionery. Gary Gerani is the creator, editor, and writer of hundreds of Topps trading card sets and the author of Topps's Star Wars series. He lives in Los Angeles.